With so many great attractions, Amsterdam is one of Europe’s most popular destinations. Apart from the brilliant canals, the cosy cafés, the wonderful atmosphere of this vibrantly cosmopolitan capital, there’s another aspect that just cannot go unnoticed which of course, is its amazing architecture. There are many iconic buildings to see on a tour of Amsterdam and below are just a few of them. Situated in the Jordaan district of the capital, the Westerkerk is a superb example of 17th century Dutch architecture. The church still holds a service every Sunday with a cantata taking place once a month. However, organ concerts are also regularly held in this stunning building as well as choral performances that are out of this world. It would be a travesty not to visit this beautiful and iconic church that stands so majestically for all to see, having stood the tests of time so very well. 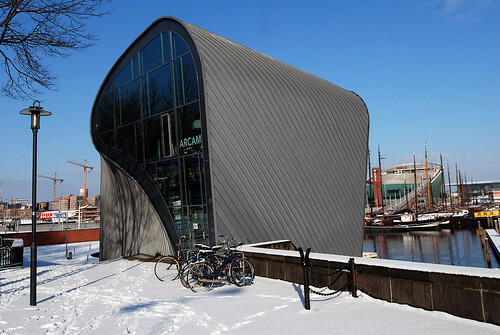 Anyone who loves modern architecture would do well to visit ARCAM where there’s a mine of information on everything you would ever need to know about how Amsterdam’s architecture developed to what is found in and around the capital today. It’s a great way to plan what to see when on a trip too and helps people understand what they are looking at architectural wise. Canalside House is perfectly placed as a gateway to exploring Amsterdam’s gorgeous canal system. A trip along the many canals will take you passed not only some of the best historical sites the capital boasts, but also passed some superb cultural ones too. Het Grachtenhuis is home to an interactive exhibition that’s well worth visiting before taking a trip down the canals – you cannot go to Amsterdam without jumping on a canal boat and taking a boat ride along these wonderful waterways and it’s one of the best ways to take in all the amazing buildings too. The Pathé Tuschinski Arthouse has to be one the most beautiful cinemas on the planet and it’s been lovingly restored to its former glory as an Art Deco Iconic building both on the interior and exterior too. The building is located right in the heart of the capital making it very easy to find. You can take a guided tour around the building which is well worth it because there’s a lot to see and find out about, including loads of information about the man who founded the theatre, a Jewish tailor called Abraham Tuschinski. Dutch film premiers are still held at the cinema in these modern times! 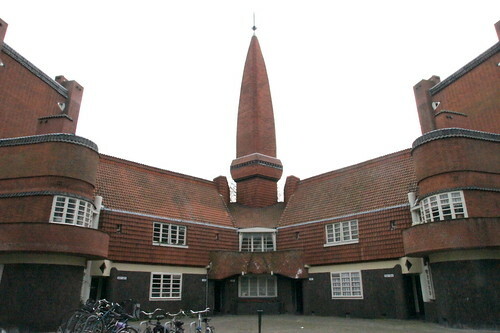 This amazing building was the hub of modern architecture back in 1915 through to the thirties and is certainly one of the most iconic buildings in the whole of Amsterdam. The architecture is quite unique boasting wavy façades, small windows placed high up on the building’s structures and towers that majestically point to the heavens. There’s a museum on-site which is where a post office used to be and which was designed by M de Klerk, one of Holland’s foremost architects of the period. The interior of the building is superb and well worth taking the time to visit. Taking a tour around Amsterdam’s wonderful canals, takes you passed some of the most iconic buildings found in the capital. From the old to the new, the designs are pretty amazing and it’s a real treat for anyone who loves architecture to take it all in. Hire an Amsterdam chauffeur for luxury and an intimate knowledge of the city. Planning a tour so you see these wonderful feats of architecture is a great experience that just gets better when you finally arrive in Amsterdam and get to see them for real.